Mike Bobo after practice on Tuesday, Aug. 6. Credit: Rich Kurtzman. After a long, long wait, game week is finally here, Rams fans. Colorado State hosts Hawaii this Saturday night at Sonny Lubick Field at Canvas Stadium and we give you game-by-bame predictions of how your Rams will finish this year. Before that, we go deep into the first depth chart of the season. Who surprised? Well, on offense, it’s basically exactly what we all expected, outside of the running back position. On defense, though, there’s a grop of youthful starters, mainly on the defensive line, as well as Rashad Ajayi in the defensive backfield. We go position-by-position and give expectations from each group and what the team will look like in terms of philosophy and more. 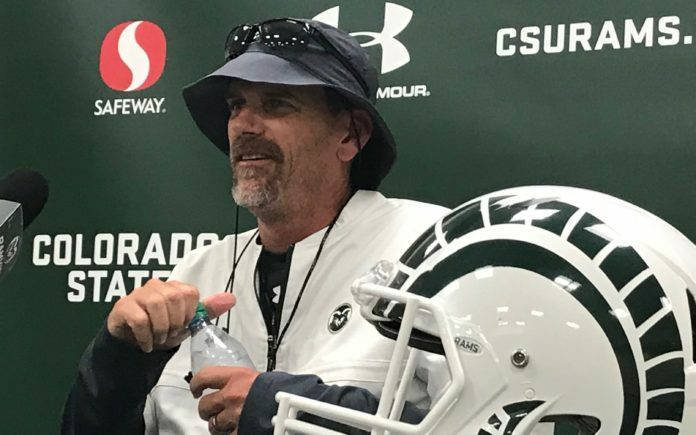 We hear from Mike Bobo on the running backs, Colby Meeks on the offensive line and Wyatt Bryan on kicking as well as the Rocky Mountain Showdown. We also get to some Next Level Rams news as many former Colorado State players are trying to make an impression in preseason as they look to make 53-man rosters across the country.